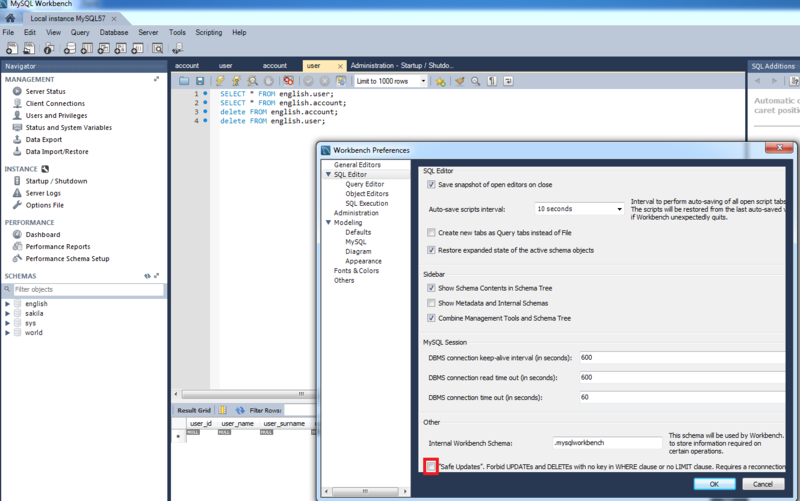 I followed the instructions, and I unchecked the safe update option from the Edit menu then Preferences then SQL Editor. The same error still appear & I'm not able to update this value. Please, tell me what is wrong? It looks like your MySql session has the safe-updates option set. This means that you can't update or delete records without specifying a key (ex. primary key) in the where clause. Or you can modify your query to follow the rule (use primary key in where clause). p.s., No need to restart the MySQL daemon! 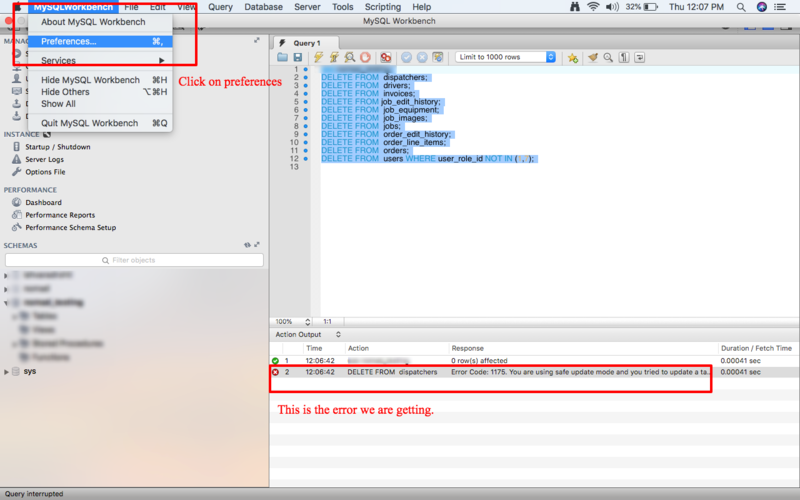 Then: Run the query that you were trying to run that wasn't previously working. WHERE (country = 'USA' AND customerNumber <> 0); -- Because customerNumber is a primary key you got no error 1175 any more. Now you can be assured every record is (ALWAYS) updated as you expect. Error Code: 1175. 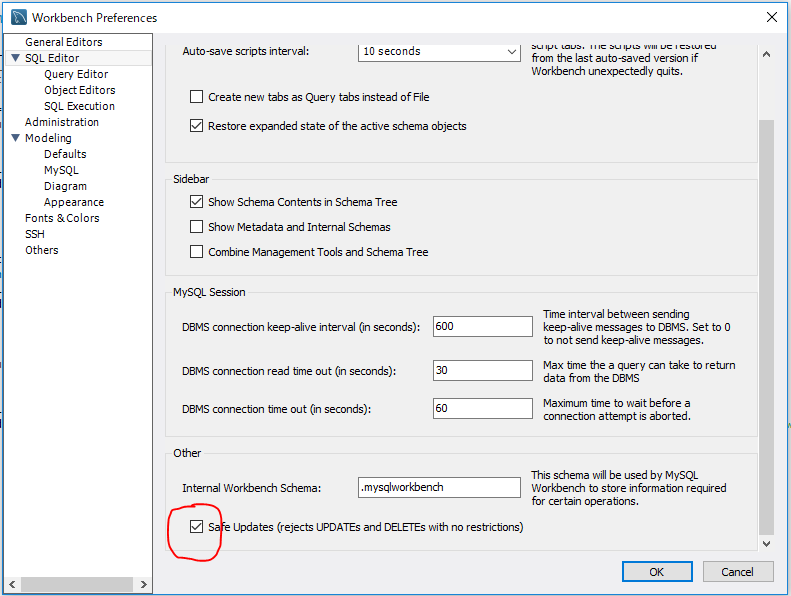 You are using safe update mode and you tried to update a table without a WHERE that uses a KEY column To disable safe mode, toggle the option in Preferences -> SQL Editor and reconnect. MySQL Workbench => [ Edit ] => [ Preferences ] -> [ SQL Editor ] -> Uncheck "Safe Updates"
If you are in a safe mode, you need to provide id in where clause. So something like this should work! 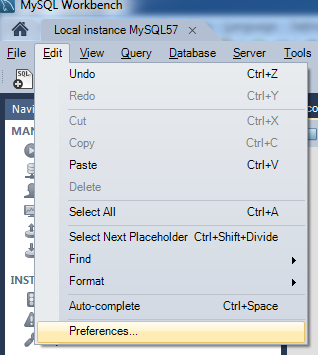 In the MySQL Workbech version 6.2 don't exits the PreferenceSQLQueriesoptions. The simplest solution is to define the row limit and execute. This is done for safety purposes. Since the question was answered and had nothing to do with safe updates, this might be the wrong place; I'll post just to add information. That worked. Well golly -- if I am always adding where key <> 0 to get around the safe update check, or even set SQL_SAFE_UPDATE=0, then I've lost the 'check' on my query. I might as well just turn off the option permanently. I suppose it makes deleting and updating a two step process instead of one.. but if you type fast enough and stop thinking about the key being special but rather as just a nuisance.. 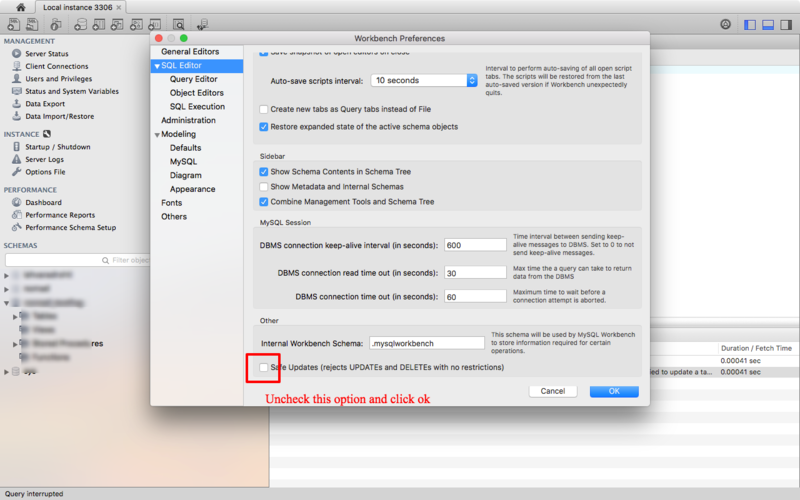 This is for Mac, but must be same for other OS except the location of the preferences. Then close and reopen the connection. No need to restart the service. Now we are going to try the DELETE again with successful results. So what is all about this safe updates? It is not an evil thing. This is what MySql says about it. For beginners, a useful startup option is --safe-updates (or --i-am-a-dummy, which has the same effect). 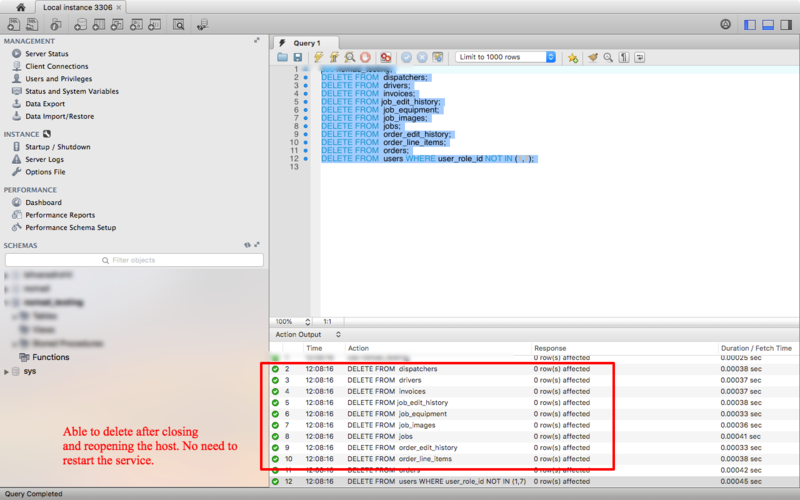 It is helpful for cases when you might have issued a DELETE FROM tbl_name statement but forgotten the WHERE clause. Normally, such a statement deletes all rows from the table. With --safe-updates, you can delete rows only by specifying the key values that identify them. This helps prevent accidents. It is safe to turn on this option while you deal with production database. Otherwise, you must be very careful not accidentally deleting important data. Not the answer you're looking for? Browse other questions tagged mysql sql-update mysql-workbench or ask your own question. 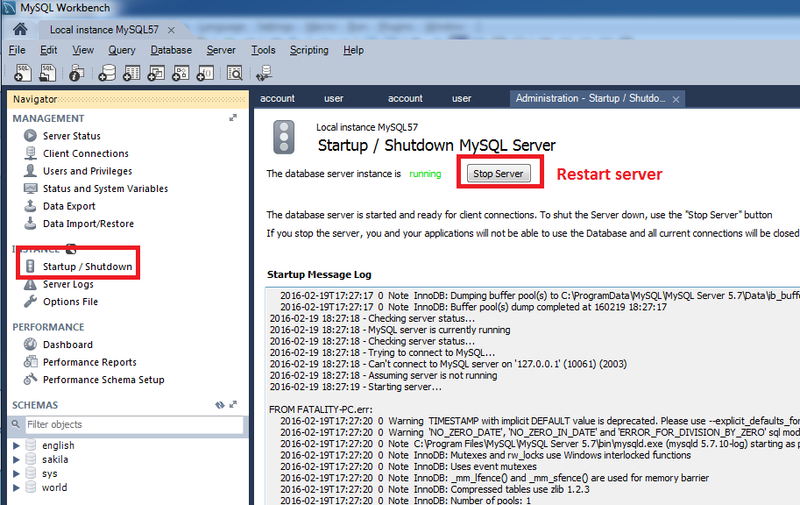 How can I got clear the error while running UPDATE query in MySQL? how to avoid this error in mysql while updating a record? Permenantly disable Safe Updates in MySQL Workbench?